Does Sprawl Promote Lyme Disease? ALBANY, NY: The First Presbyterian Church was the location of the March Save the Pine Bush vegetarian dinner which featured the excellent presentation on biodiversity and Lyme Disease by Kathleen LoGiudice, PhD. Lyme disease is caused by the spirochete, Borrelia burgdorferi. The first symptom (in some but not all people) is a distinctive-looking bull’s-eye rash, which is caused by the reproduction of the spirochete. In the early stages, Lyme disease is easily treated by the use of anti-biotics. Left untreated, Lyme disease can have serous effects, including arthritis, extreme fatigue, and heart and central nervous system problems. Lyme disease is difficult to treat once such symptoms appear. Borrelia burgdorferi lives in the black-legged tick. The tick has three life stages: larvae, nymph and adult. Because Lyme disease is not passed down from adult tick to the tick eggs, all tick larvae are hatched without harboring Borrelia burgdorferi. In order to transmit Lyme disease, the tick must become infected during its lifetime. The tick has three blood meals, one at each life-stage. During the larval stage, the ticks will feed on a variety of hosts, including mice, shrews and birds. After its blood meal, the larva drop off the host into the leaf litter. Being bit by a larval tick poses no risk to humans, because no larval tick is infected with Lyme disease. If a larval tick bites a host that is infected with Lyme disease, then during its next phase, as a nymph, the tick can pass Lyme Disease on to the next host. It is ticks in the nymph stage which pose the most risk to humans. Adult ticks feed mainly on deer. It is the prevalence of Lyme disease among tick nymphs that predicts the risk of Lyme disease for humans. Dr. LoGiudice created a mathematical model to predict the effects of biodiversity on the prevalence of Lyme disease. To do this, she first had to determine the percentage of larval ticks who feed on various hosts who became infected with Lyme disease. In the laboratory, she determined that 92% of larval ticks that fed on infected white-footed mice became infected. However, when testing larval ticks in the field, she found that only 38% of the ticks were infected, which means the ticks were feeding on other hosts which did not transmit Lyme disease as well as the white-footed mouse. In her experiment, she measured how likely ticks were to become infected by various host animals. To do this, animals were trapped (or in the case of deer, killed) and kept in the laboratory for 72 hours in individual cages. The cages were suspended over a dish of water. During the 72 hour period, ticks would drop from the host animal. (Other, less pleasant things dropped off too - but Dr. LoGiudice did not go into a lot details about this more disagreeable part of the research!) The ticks were counted and tested for the prevalence of Lyme disease. Once these brave animals did their duty in the laboratory, they were returned to the site from which they were captured. A local farmer donated the deer. The farmer had a problem with deer eating his corn, so he would shoot the deer. He then donated the deer meat to an organization for the homeless, and give the head, hide and feet to Dr. LoGiudice for analysis. Dr. LoGiudice then created a chart showing the expected nymphal tick infection based on the animal host. So, if all of the animals in the forest were white-footed mice, 92% of the ticks would be infected with Lyme disease. However, other animal hosts are not as good at passing on the infection, so as these animals are added to the forest, the rate of infection declines. 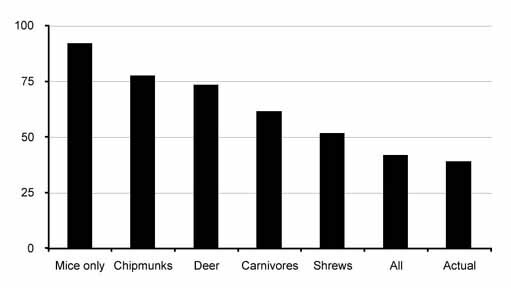 For example, the eastern chipmunk was the next most competent at passing on Lyme disease to ticks with 55% of ticks getting Lyme disease from chipmunks. This mathematical model indicates that the more species, the more biodiversity, the less risk of Lyme disease. the rate of animals infected with Lyme Disease declines. She also cited a study by Allen, Keesing and Ostfeld on the Effect of Forest Fragmentation on Lyme Disease Risk. This study was very small, but it tended to indicate that Lyme disease was more prevalent in small forest fragments, than in large forests. Dr. LoGiudice then posed the question: Does Sprawl promote Lyme disease? So, then does A = C; Sprawl increases Lyme disease risk? There are many assumptions in the model Dr. LoGiudice proposes including that diversity declines in predictable manner. In the decline of biodiverstiy, which species are lost first? What if there is a different set of rules to remove species? What if species are lost in relation to their body mass? Applying different rules for the loss of biodiversity would create a very different looking chart. Dr. LoGiudice’s chart adds animals in order of their ability to pass on Lyme disease. She also showed us a chart that shows animals in relation to their body size and the chart looked very different. More study is needed. Dr. LoGiudice does not want the same mistakes made about the effects of biodiverstiy on human health made that were made with the issues of acidic lakes in the Adirondacks and global warming. Because early studies of these subjects showed there may be a problem, corporations that would be adversely affected obfuscated the issues by attacking the science before definitive answers came in. Still, in the public mind, despite the now overwhelming scientific evidence of problems, people still don’t understand the issues. Dr. LoGiudice does not believe we should run right out and and change our zoning laws until we have definitive answers on how biodiverstiy affects human health.